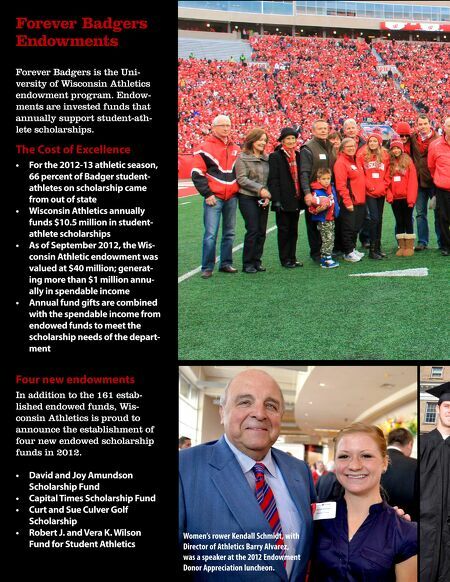 Forever Badgers Endowments Forever Badgers is the University of Wisconsin Athletics endowment program. 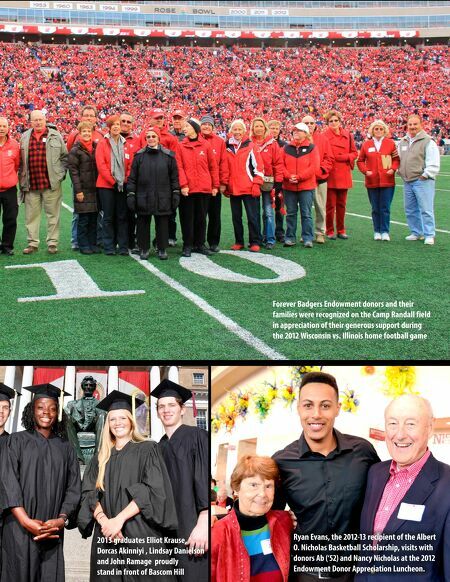 Endowments are invested funds that annually support student-athlete scholarships. The Cost of Excellence • For the 2012-13 athletic season, 66 percent of Badger studentathletes on scholarship came from out of state • Wisconsin Athletics annually funds $10.5 million in studentathlete scholarships • As of September 2012, the Wisconsin Athletic endowment was valued at $40 million; generating more than $1 million annually in spendable income • Annual fund gifts are combined with the spendable income from endowed funds to meet the scholarship needs of the department Four new endowments In addition to the 161 established endowed funds, Wisconsin Athletics is proud to announce the establishment of four new endowed scholarship funds in 2012. • David and Joy Amundson Scholarship Fund • Capital Times Scholarship Fund • Curt and Sue Culver Golf Scholarship • Robert J. and Vera K. Wilson Fund for Student Athletics Women's rower Kendall Schmidt, with Director of Athletics Barry Alvarez, was a speaker at the 2012 Endowment Donor Appreciation luncheon.